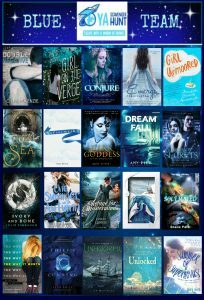 YA Scavenger Hunt: Check it out… Hot Titles on the Blue Team! update: 4/10/17: JENNIFER FRENDER is the winner of the Amazon gift certificate. I’ll contact you via email. Go to the YA Scavenger Hunt page to find out all about the hunt. There are SIX contests going on simultaneously, and you can enter one or all! 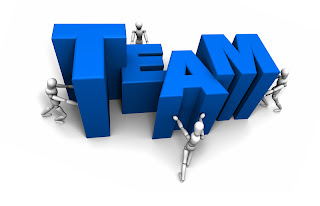 I am a part of the BLUE TEAM–but there is also a red team, a gold team, an orange team, a red team, and an indie team for a chance to win a whole different set of books! Directions: Below, you’ll notice that I’ve listed my favorite number. Collect the favorite numbers of all the authors on the blue team, and then add them up (don’t worry, you can use a calculator!). 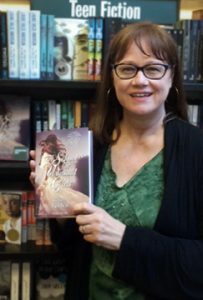 Today, I am hosting KATHLEEN BALDWIN on my website for the YA Scavenger Hunt! Kathleen Baldwin loves adventure in books and in real life. She taught rock climbing in the Rockies, survival camped in the desert, was stalked by a mountain lion, lost an argument with a rattlesnake, spent way too long in college, fell in love at least a dozen times, and married her very own hero. They have four free-spirited adventurous children. 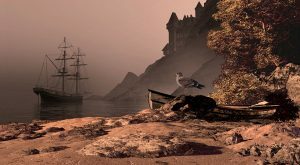 Today Kathleen will tell you a little about book 3 in the Stranje House series: REFUGE FOR MASTERMINDS and share with us some artwork related to this historical spy series. Stranje House stands on the cliffs of southern England. An ideal location for spies traveling to and from France. They are outcasts. The gifted girls at Stranje House don’t fit into Britain’s high society. Georgiana is a scientist set on developing an undetectable invisible ink. Lady Jane has a knack for planning and strategy. 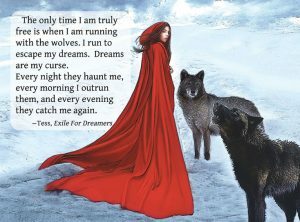 Tess has nightmarish prophetic dreams. 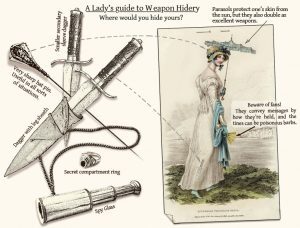 Young ladies during the Regency were to be seen and not heard. An impossible task for the irrepressible young women of Stranje House, so the headmistress puts their various talents to use, secretly training them to be spies in the war against Napoleon. The young ladies at Stranje House are studying more than embroidery and good posture. This is a page straight out of Tess’s notebook. It’s 1814. Napoleon has escaped his imprisonment on Elba. Europe is in shambles. Britain is at war on four fronts. Stranje House is a School for Unusual Girls, where five young ladies are secretly being trained for a world of spies, diplomacy, and war…. Lady Jane Moore hides a secret. A secret that must be kept buried. If anyone finds out the truth, her life at Stranje House will crumble. How will her friends survive without her? With Napoleon Bonaparte threatening to invade England, everyone at Stranje House is in mortal danger. There is a traitor in Stranje House. Someone is sneaking information to Napoleon’s ruthless spies, Lady Daneska and Ghost. Jane is determined to find out who it is before suspicions rip apart the bonds of friendship at Stranje House. Her desperate hunt for the traitor ensnares a brash young American inventor, Alexander Sinclair, Robert Fulton’s nephew, in an ambush that puts his life in danger. Sinclair is the most maddening young man in all of Christendom, a sharp-tongued rascal with boorish manners, but Lady Jane cannot bear the thought of anyone harming the golden-haired genius. Is Jane enough of a mastermind to save Alexander, her friends at Stranje House, and possibly England itself? 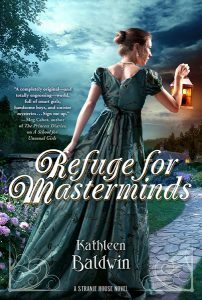 REFUGE FOR MASTERMINDS will be released on May 23rd. Want to get your hands on this book? Get it at Barnes & Noble, Amazon, Macmillan, or any bookseller. Patty here again! Don’t forget to enter the contest for a chance to win a ton of books by me, Kathleen Baldwin, and more! To enter, you need to know that my favorite number is 3! Add up all the favorite numbers of the authors on the blue team and you’ll have all the secret code to enter for the grand prize! To keep going on your quest for the hunt, you need to check out the next author, MINDI MCGINNIS! The Stranje House ladies sound quite interesting! Stranje House Series is one of my all time favorites! Aaawwh,THANKS! Have fun on the hunt!